Here are 5 healthy, whole-food pre-workout snacks that are way tastier than a protein shake! While a pre-workout protein shake is easy, and there may be particular benefits to pre-workout whey protein, sometimes it’s nice to mix it up and eat something delicious instead. In this article, I share with you 5 recipes for healthy, whole-food pre-workout snacks that I’ve really liked. Enjoy! Without the sides of hash potatoes and sausage, this brunch classic makes a healthy and delicious snack. Use a round cookie cutter (or the rim of a cup) to cut out the middles of two slices of sprouted wheat bread (my favorite is Ezekiel bread). Heat a skillet over medium heat, add 1/2 tsp. of butter, and add bread. In the holes in the bread slices, add 1/2 tsp. butter and melt. Crack one large egg in the center of each slice. 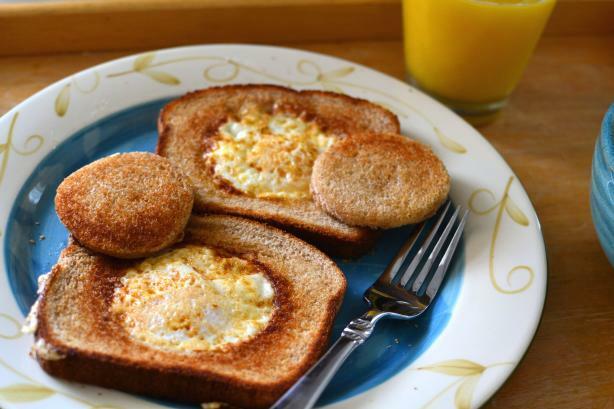 Sprinkle with salt and pepper.When the egg white is set, carefully flip over the bread so as to keep the yolk inside. Toast the two extra bread rounds. Serve warm. This simple snack is popular with the knee-high crowd, but it’s also a great way to fill up without feeling overly full. 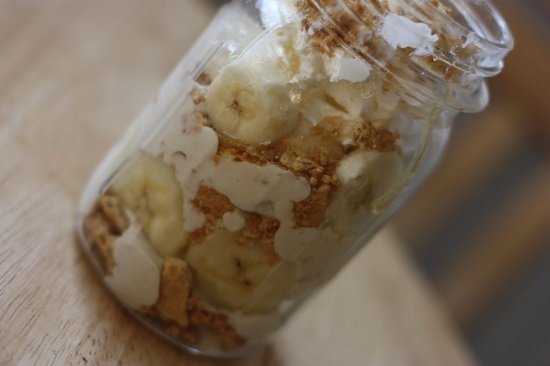 One large banana and a tablespoon of chunky peanut butter equal 215 calories, but for a more substantial snack, they can be turned into a decadent yogurt parfait. Swirl the peanut butter into 6 oz. non-fat Greek yogurt. Layer the bananas and yogurt in a bowl with 2 Tbsp. old-fashioned rolled oats. Top with a dash of cinnamon. Rice pudding is a delicious, healthy dessert, but this naturally sweetened version is an excellent pre-workout snack too. It takes a while to make, but this recipe makes six servings and will be just as tasty cold as it is warm. 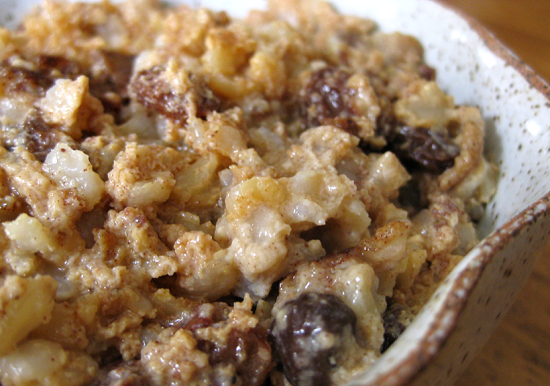 In a medium saucepan, bring 1 cup brown rice and 4 1/2 cups unsweetened vanilla almond milk to a boil. Simmer over medium-low heat until the rice has absorbed the liquid, about 45 minutes. Stir regularly. Then to make a natural syrup, soak 2 cups pitted dates in 1/2 cup boiling water for 15 minutes. Blend or puree until the mixture becomes smooth. Once rice is ready, add 2 scoops unflavored whey protein powder, date syrup, 1 cup toasted slivered almonds, 1/2 cup golden raisins, 1 tsp. vanilla extract, 1/2 tsp. almond extract, and 1/4 tsp. cinnamon. Makes 8 servings. Picture courtesy of Can You Say For Dinner? Early to bed, early to rise? If you need a hearty breakfast before a morning workout, or before commuting on two wheels to work, this bowl of healthy oatmeal will do the trick. And there’s no added sugar! 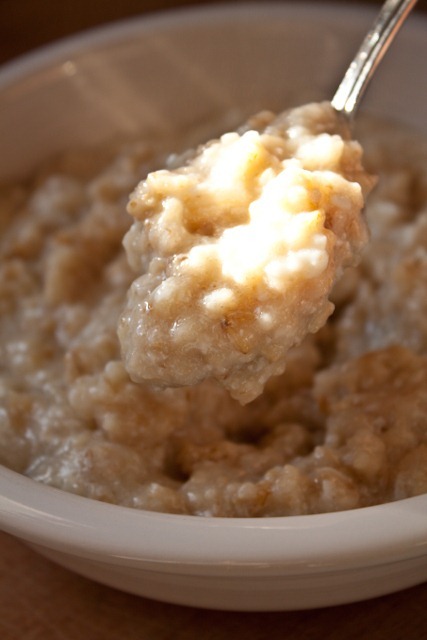 Over medium-high heat, simmer add 2/3 cup old-fashioned rolled oats and 1 1/3 cups water, about four minutes. Reduce heat to medium-low and cook for about 5 more minutes, stirring often. In a small bowl, whip 4 egg whites and 1/2 tsp. pure vanilla extract until frothy. Once the oats have absorbed most of the liquid, add egg mixture and whip with a heavy spoon. Bring heat back up to medium, and add 1/2 tablespoon of salted butter. Keep on heat at a simmer for another 4 minutes, until creamy, and then cover the pot to let oats finish cooking for 5 minutes. Serve hot. These thin fries are a great way to get some healthy carbs before you exercise. Pop them in a tall cup, and you can snack on these fresh-from-the-oven sweet potato matchsticks as you drive to the gym. Pair with a couple ounces of organic beef jerky for a salty snack that’ll prepare you for a serious workout. 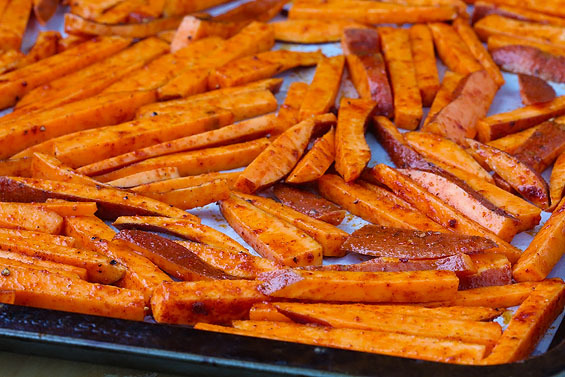 Preheat the oven to 450°F, and cut a medium sweet potato in half lengthwise. Cut both pieces into 1/4-inch thick strips, and on a large baking sheet roll the matchsticks in 1/2 tablespoon olive oil. Spread out thin sweet potato strips in a single layer, and sprinkle with 1/4 teaspoon salt. Bake for a half hour, or until crispy. Season with sumac or paprika. What did you think of these healthy pre-workout snacks? Have anything else to share? Let me know in the comments below!